austindogandcat.com: Austin photog captures beauty of dogs in Central Park -- the one in NEW YORK!! Austin photog captures beauty of dogs in Central Park -- the one in NEW YORK!! On a business trip to New York a few years back, commercial photographer Fran Reisner took an early walk in Central Park. "I stopped in my tracks watching these dogs racing around. A black Scottie took off with a red ball in his mouth and others chased him. But they never got out of order. It was like a train," she recalls. It seemed every corner she rounded offered the same view. The glory of the park in full bloom, cherry blossoms falling like confetti and dogs frolicking. Three years and seven trips later comes "The Dogs of Central Park." The photographer from Austin, Tx. who lets her own two rescue pups loose in her yard, estimates that she tromped close to 700 miles through the park to capture the hardly elusive New Yorkers. 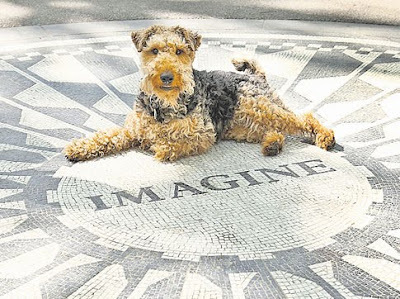 In the book, dogs are just everywhere in the park, as they are in life — lounging on the "Imagine" mosaic in Strawberry Fields, posing in front of the Dairy, communing at Bethesda Fountain and, of course, paying homage to the sculpture of the noble Balto. "I wanted to capture all the seasons and as much of the iconic Central Park background as I could," Reisner says. Much of her picture-taking was done in the early morning since dogs in the park don't have to be leashed until 9 a.m. She found many of the pups had formed special relationships. The same was true for owners. With one caveat. "They all think their dog is THE dog," she laughs.